The Hagia Sophia is located in the country of Turkey, in the city that is now called Istanbul. because an emperor named Constantine named it after himself. In the 6th - 7th centuries, the leader of Constantinople, who was called Emperor Justinian, commanded that 10,000 workers build him a Christian church. The Hagia Sophia is the result. It is called a Byzantine Church, since it was built in a period of time called the Byzantium. It has a huge golden dome. This church eventually became a Mosque, for people of the Muslim faith. The towers on the corners, called Minarets were added when it became a Mosque. 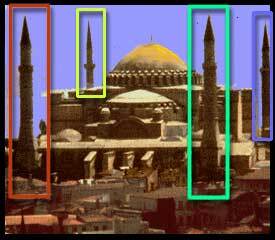 What was the purpose of the Minaret towers on a Mosque?